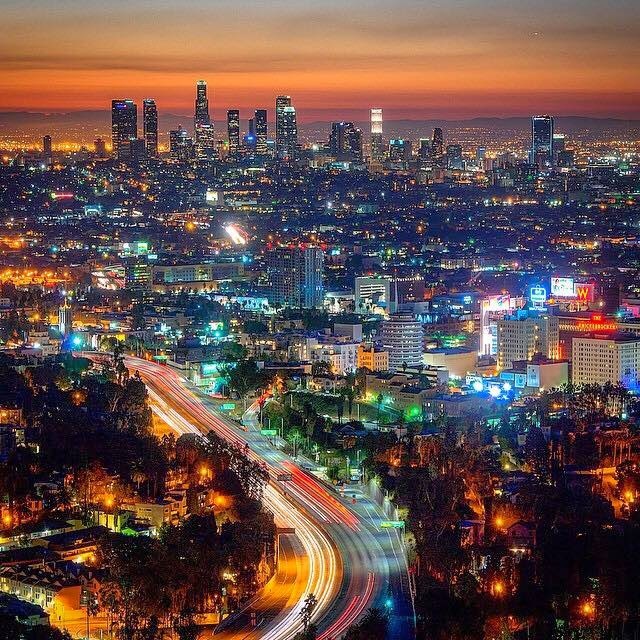 Another incredible image from Los Angeles based photographer Andy.C Photography. This is looking towards downtown Los Angeles at sunrise, taken from the Hollywood Bowl outlook in the Hollywood Hills. Many more outstanding photographs on his Facebook page. 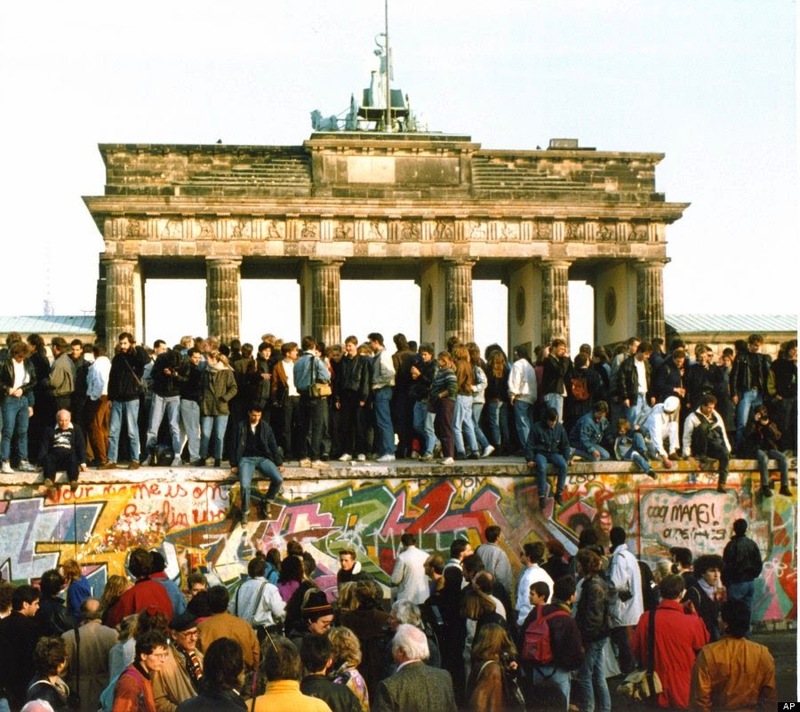 TODAY, November 9, 2014, marks the 25th anniversary of the fall of the Berlin Wall. 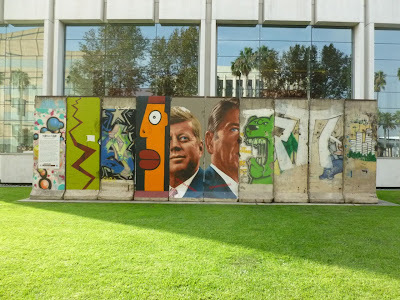 To commerate, I decided to repost photos of the largest section of the Berlin Wall found outside of Germany - found along Wilshire Blvd in Los Angeles. These side-by-side portraits of Presidents John Kennedy and Ronald Reagan were painted by Los Angeles based muralist Kent Twitchell. 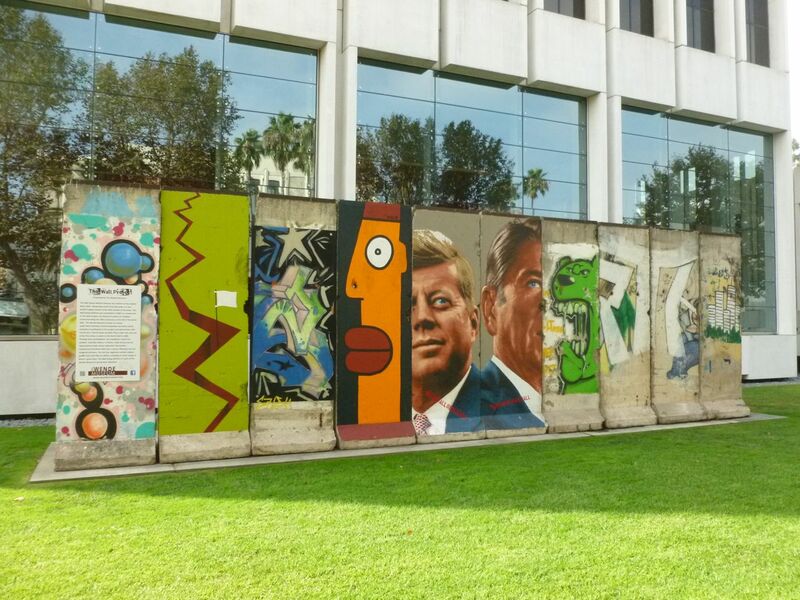 The ten panel section of the Berlin Wall is located in the Miracle Mile District - at 5900 Wilshire Blvd. 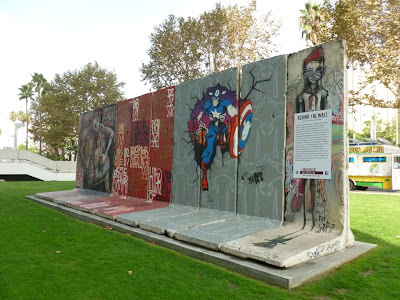 The Wall Along Wilshire was assembled five years ago as a component of The Wall Project, the Museum’s public art initiative commemorating the (at the time) 20th anniversary of the fall of the Wall. 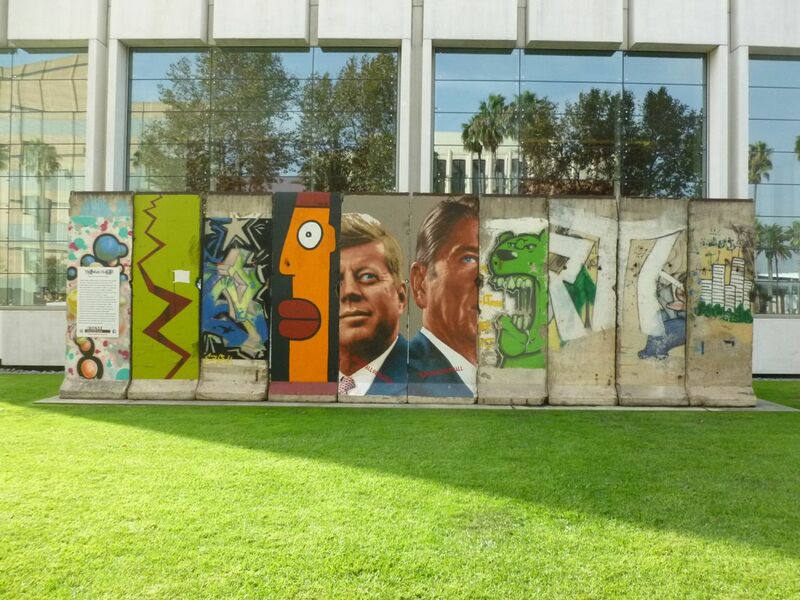 The Wall Along Wilshire is located across the street from the Los Angeles County Museum of Art (LACMA). I literally stumbled across it last month after taking a few minutes to see Michael Heizer's Levitated Mass a few hundred yards away. Levitated Mass at the LACMA is a unusual piece of modern art; the Wall Along Wilshire is a piece of modern history. Levitated Mass got national media coverage. The Wall Along Wilshire: not so much. Initally, I was not a fan of Levitate Mass (although I warmed up a bit when I visited a second time with my kids). Like other pieces of history, there is a sense of soberness to the Wall Along Wilshire. And in a sense, ten million dollar modern art projects like Levitated Mass exist because the Berlin Wall does not. "We Are All Berliners" ("Ich Bin Ein Berliner") - President Kennedy's immortal words in June 1963. Here's a link to a video of the speech. 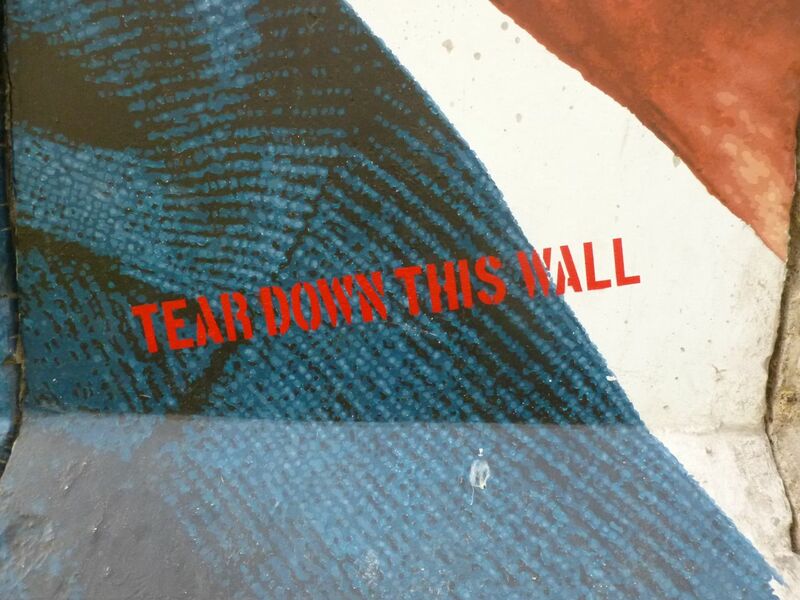 "Tear Down This Wall" - Ronald Reagan's moving challenge to Soviet General Secretary Mikhail Gorbachev in June 1987. And here's a link to a video of President Reagan's speech. By the Fall of 1989, just 2 1/2 years after Reagan's speech, the Wall was opened - siginaling the end of the Cold War, and - ultimately - the Berlin Wall. I love muralist Kent Twitchell's portraits of Cold War Presidents Kennedy and Reagan. 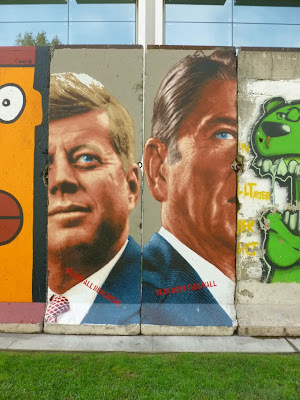 Democrat and Republican: two generations, two eras, two Cold Warriors who both challenged the Soviet Union regarding the Wall - one when it was first completed, the other before it finally came down. 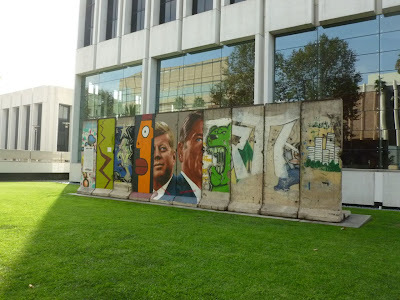 "The Wall Along Wilshire features ten sections of the original Berlin Wall. Measuring nearly forty feet wide, it is the world longest stretch of the Wall outside of Germany. The Wall Along Wilshire was assembled in 2009 as a component of The Wall Project, the Museum’s public art initiative commemorating the 20th anniversary of the fall of the Berlin Wall. The Wend Museum invited L.A. based artists Kent Twitchell, Farrah Karapetian and Marie Astrid Gonzalez to participate in the project and paired them with French-born, Berlin based muralist Thierry Noir who was one of the first artists to paint the Berlin Wall in 1984. Through their participation, the installation recalls the outdoor “Eastside Gallery” in Berlin, made famous by the international artists whose collective intervention transformed the Berlin Wall into a canvas reflecting real and imagined divisions. The last four segments contain original graffiti from Cold War era Berlin, including an iconic image of Bimer’s green bear. The Wall Along Wilshire is part of The Wende Museum’s permanent collection." 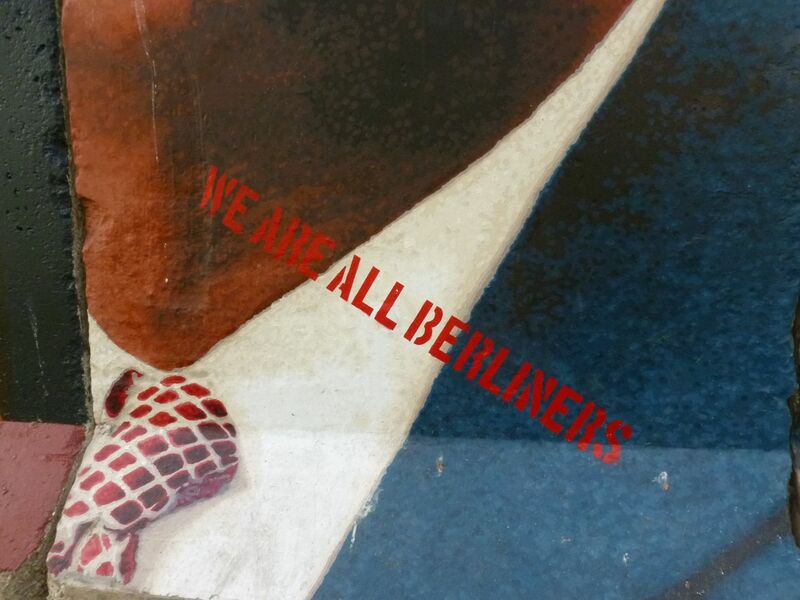 "As part of The Wende Museum’s SURVEILLANCE PROJECT, Behind the Wall brings together street artist from Los Angeles, London, and Berlin to interpret the roll of surveillance in our lives from the Cold War until today. From left to right, the murals by Herakut, Retna, and D*Face, cover nine segments belonging to the ‘east side’ of the original Berlin Wall- the side that face the East German death strip and was never painted." "In order to preserve the segments and prevent moisture from rusting the Wall’s inner skeleton, a special water-resistant primer has been applied and the artist’s paints provide and additional layer of protective coating." 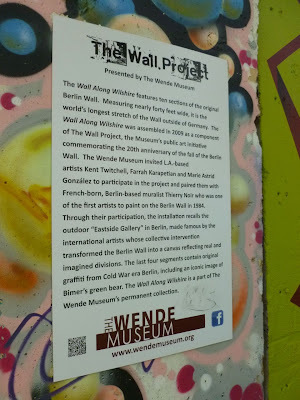 "With continued care, The Wende Museum’s Berlin Wall segments will remain a historical and vibrant outdoor canvas that connects contemporary issues with significant historical events that impacted the globe – the East German peaceful revolution, the fall of the Berlin Wall, and the end of the Cold War." Many many thanks to the Wende Museum for this OUTSTANDING display. 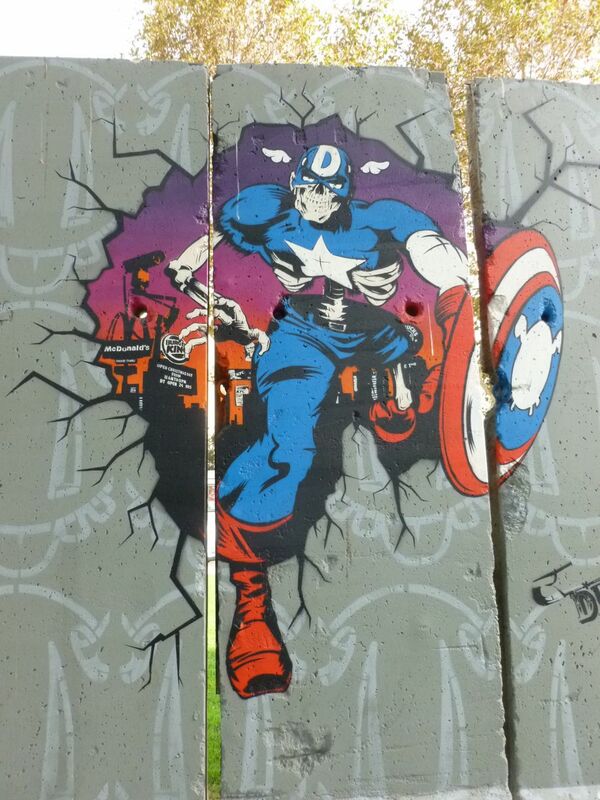 It is incredible that Los Angeles is home to the largest section of the Berlin War outside of Germany. It is a piece of history. Here's another link to when I took my kids to see it back in March of 2013. Yes, it's worth visiting. And I'm definitely looking forward to visiting The Wende Museum (located six miles south in Culver City) sometime in the near future.